iRealHousewives | The 411 On American + International Real Housewives: Teddi Mellencamp Arroyave And Meghan McCain End Their Feud After Andy Cohen Appears On The View! Teddi Mellencamp Arroyave And Meghan McCain End Their Feud After Andy Cohen Appears On The View! Teddi Mellencamp Arroyave and Meghan McCain have squashed their feud. It all went down when Andy Cohen appeared on The View this week to promote the new season of FOX's Love Connection. 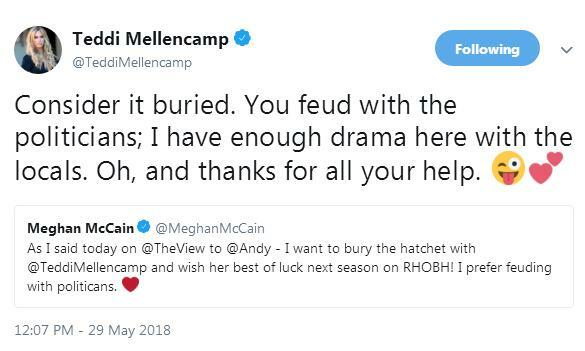 The topic shifted to The Real Housewives of Beverly Hills where Meghan brought up her Twitter beef with Mellencamp Arroyave. McCain told Cohen that she still thinks Teddi is "boring," adding that "I think Erika and I probably got her a second season and it makes me angry." However, Andy disagreed with her by saying: "I think maybe she got that herself a second season with all due"
Then, Meghan revealed to Andy that she wanted to end her beef with Teddi. 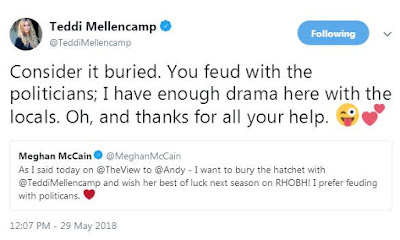 Following the episode, Meghan reached out to Teddi on Twitter to "bury the hatchet." "As I said today on @TheView to @Andy - I want to bury the hatchet with @TeddiMellencamp amd wish her the best of luck next season on #RHOBH! I prefer feuding with politicians," she wrote, adding an emoji heart. Teddi replied: "Consider it buried. You feud with the politicians; I have enough drama here with the locals. Oh, and thanks for all your help," she wrote. If you may recall, their feud stems from McCain, an avid Housewives fan revealed back in February what she thought about Teddi on Watch What Happens Live with Andy Cohen, labeling her as "boring." "I don't like her," said McCain at that time. "She's boring. Please stop hiring people because they have famous last names, and I say that as a woman with a famous last name. I just find her so boring, no offense." Teddi took to Twitter while the show was airing to say, "Be right back, changing my last name to Boring." Be right back, changing my last name to Boring. "I would never comment on how I think Meghan McCain does at her job," Teddi told TooFab back in March. "I just wouldn't. That's not my place. I'm about empowering other women to be the best they can be." "I take boring as a compliment," said Teddi. "I truly do, because if anybody is such a show all the time, that's probably not their authentic self. Most of us are pretty boring. I love my life, and regardless of what my last name is, I think in every friend group, there's gotta be balance."